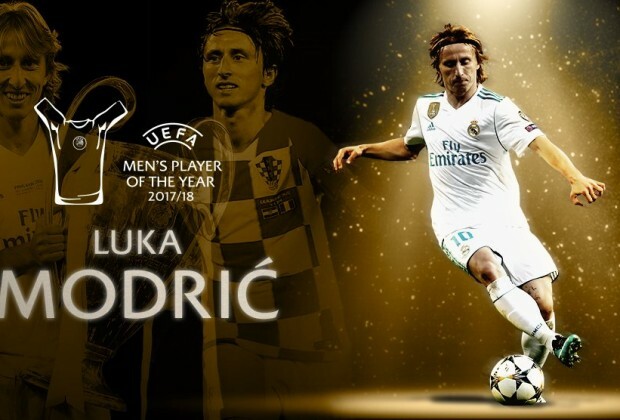 Modric won the individual accolade for his exploits with Real Madrid last season, that saw him lift the UEFA Super Cup, the Supercopa de Espana, the FIFA Club World Cup and the UEFA Champions League. The award recognises the best players, irrespective of nationality, playing for a club within the territory of a UEFA member association during the past season. Players are judged on their performances in all competitions – domestic, continental and international, according to UEFA. Modric's closest rivals were African Footballer of the Year Mohamed Salah and his former Real teammate Cristiano Ronaldo. Salah can look back on a record-breaking debut season with Liverpool, during which he scored 44 times and set up another 16 goals for his teammate, while Ronaldo also netted 44 goals and assisted another eight strikes for Los Blancos. Modric, meanwhile, was seen as the brain behind Real's four trophies and was named the Player of the Tournament at the Club World Cup as well as the 2018 FIFA World Cup, where his team Croatia finished as runners-up. Penaldo and his fans right now.....are crying. Final the tapp inn king is nowhere to be found.